What kind of meeting are we having? What’s the difference between an annual meeting, special meeting, town hall meeting, and board meeting? With so many different types of meetings in community associations, it’s easy to get confused. Here’s some clarification. Annual meetings are required by community association governing documents, which specify when they’re to be conducted and how and when members are to be notified about the meeting. This is the main meeting of the year when members receive the new budget, elect a board, hear committee reports, and discuss items of common interest. Special meetings are limited to a topic. The board can call a special meeting at any time, and they must notify all members in advance. The notice will specify the topic so interested members can attend. Special meetings give the board an opportunity to explore sensitive or controversial issues—like an assessment increase. Members do not participate in the meeting, unless asked directly by a board member, but they have a right to listen to the discussion. Town hall meetings are informal gatherings intended to promote two-way communication; full member participation is essential to success. The board may want to present a controversial issue, explore an important question like amending the bylaws, get a sense of members’ priorities, garner support for a large project, or clarify a decision. Board meetings are where most association business is conducted. Board members set policy, review operations, resolve disputes, and plan for future initiatives. Often, the health and harmony of an entire community is directly linked to how constructive these meetings are. Executive session is the only time residents can’t listen in on the board’s discussions. By law, the topics that the board can discuss in an executive session are limited to a narrow range of sensitive issues. Depending on what state you live in, once the sensitive matters have been discussed, the board must adjourn the executive session and resume an open session before voting on an issue. Check with your association attorney for specifics on when to go into and how to run an executive session. Don’t forget to tune into our YouTube channel for the latest news about CAI’s events. 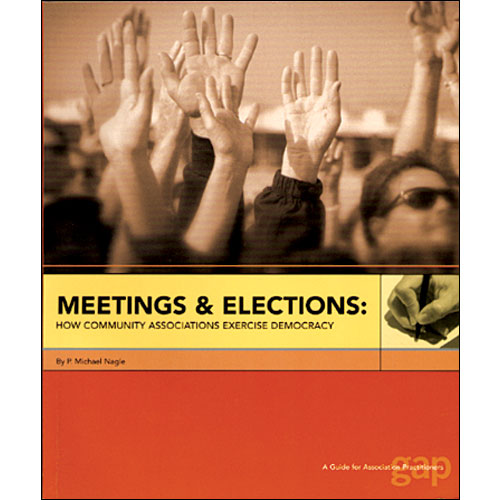 For more information about this topic check out CAI’s Meetings & Elections, available for purchase at CAI Press.